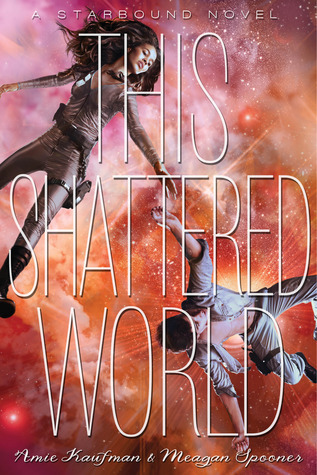 Presenting Starbound #2 This Shattered World by Amie Kaufman & Meagan Spooner. 'Tis a new story. 'Tis a new world. 'Tis a new pair. but equally epic star-crossed pair as the first. It is always a concern with series featuring new lead pair in every story, if the readers could form a connection with the new characters as they did for the previous ones. But fear not just like Tarver & Lilac, Jubilee & Flynn will make you feel right at ease in their high-octane space opera. The girl Jubilee Chase, a soldier sent to Avon to route out the rebellion. The boy Flynn Cormac, a rebel, who only wants what should have been given as right. Jubilee Chase, a badass famed soldier, pretty set in her rules and a no-nonsense woman. Flynn Chase, not your typical buff rebel but shrewd and honorable to boot. Both passionate and resilient beings, situations may have set them apart but inherently they are the same and when they meet, they connect and share. The stakes are high. Avon is ready for a great war. Thus, Jubilee and Flynn learn to trust one another even against the backdrop of their warring factions. She is the action-centered one, Flynn forms her voice of reason. Change is inevitable and our stubborn, set-in-their ways pair soon realize that if they wish to see Avon flourish, then they must put aside their past and their deep set beliefs to work together. 'Star-crossed' lovers they may be but stubborn they both are. Like Romeo & Juliet they may feel but strong characters like them (Lee & Flynn) need no comparisons at all. The romance is there of course, the promises made, passion displayed but it doesn't let itself be heavy on the plot and lets the action carry it in its current..... And what chemistry *swoons* ... They truly don't need comparing with Romeo & Juliet at all, if I do say so myself. Of course Kaufman & Spooner didn't finish it there. The connection between "These Broken Stars" and "This Shattered World" was just fantastically portrayed. Tarver & Lilac and Jubilee & Flynn, the connection is surprising, its subtle but its also obvious. In a good way it jumps at you when you are least expecting it. It was great to see them again and helping each other out in their fight against the common enemy and persevering till it lasts. Such high-stakes, high-octane action. Where "These Broken Stars" had more of a surviving-exploring aura, "This Shattered World" was filled to the brim with nerve-wracking action. The authors build this new world from scratch and they built it brilliantly. The atmosphere is just right, the characters are strong & well developed and the plot is well balanced with its own share of excitement..... A gem that must not be missed...... ohhhh already anticipating what will happen on Corinth next. "A high-octane sequel. An exhilarating drama fit to be experienced. Bravo"
I really want to get started on this series. My book club read it this year but I was so busy I wasn't able to participate with them. It was a bummer!! I also loved this book! I thought it was even better than the first book (which was EXCELLENT). Fabulous review!